Pre-Reading Activity: All Lined Up! For preschool, we play a lot of games. What better way to learn than having fun, right? So, I’ll share my go-to preschool reading activity. Even if my child is not in a “learning” mood, she’ll agree to play this game and that’s fine with me. I know how much she’ll learn each time we play! In fact, this is an activity she asks for by name. 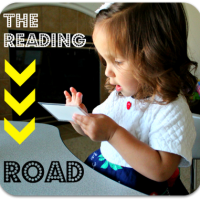 “Mommy, can we play the Lined Up game?” I love it because it teaches her pre reading skills like sequencing, memory, and develops left to right reading habits. 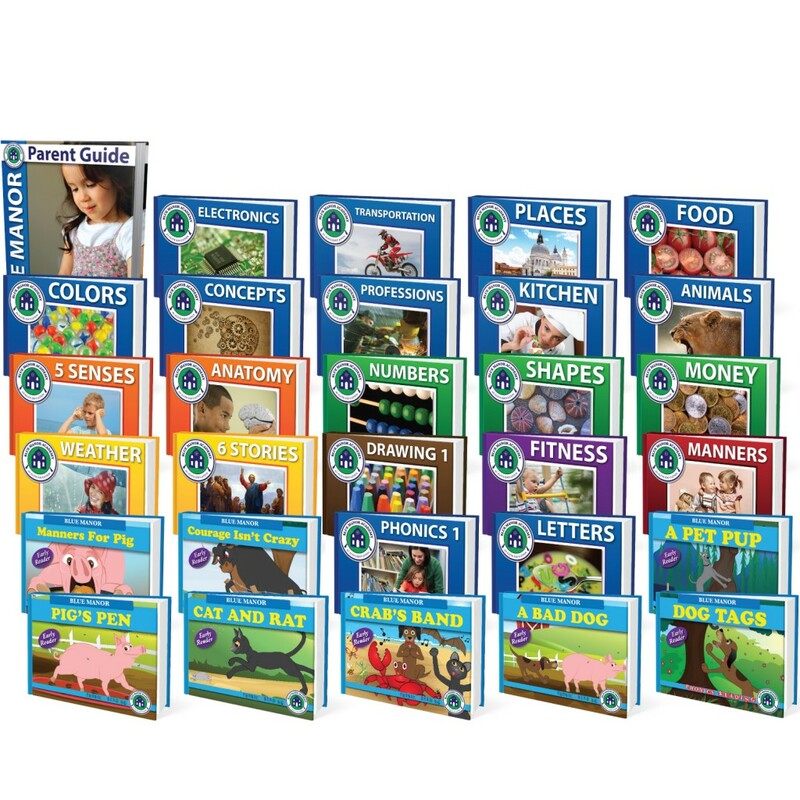 Did I mention it’s probably the easiest reading game to teach? 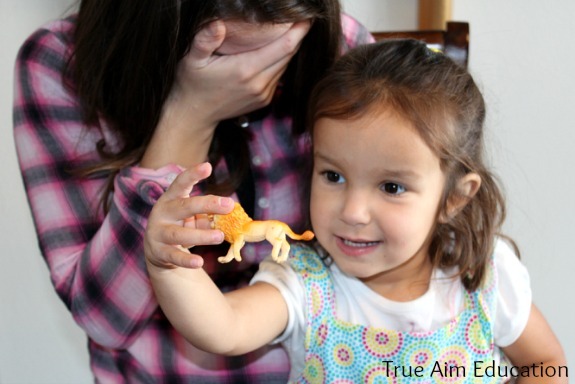 2-year-olds, even some 1-year-olds can learn how to play. How to Play All Lined Up! 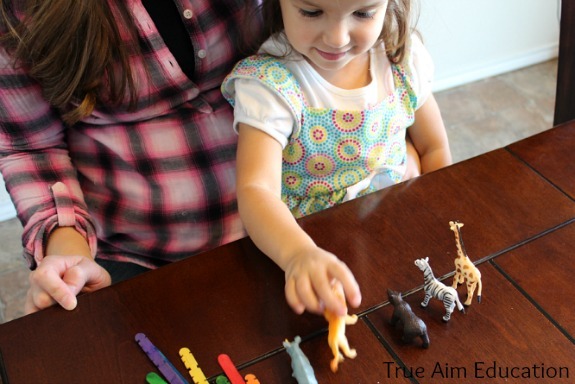 First, choose 3-8 different toys for your child to line up. Keep your child’s skill level in mind when choosing items. If he’s never played before, you will want to choose toys that are very different from each other. 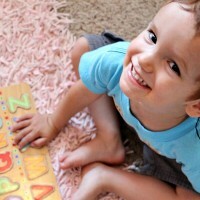 If he’s a pro, you could start using letters, numbers, or even sight words. Make sure he knows what all the objects are called before you start. Then you’ll explain some simple vocabulary. Put the toys in a pile and ask your child to line them up. If he doesn’t know what a line (or row) is, do it for him and then pile the toys back up and have him rearrange them into a line again. Talk about the beginning of the line and the end of the line, the start and the finish, first and last. You don’t have to teach all this vocabulary the first time you play, but add a little at a time. I’ve now taught my daughter 1st, 2nd, 3rd, and so on. 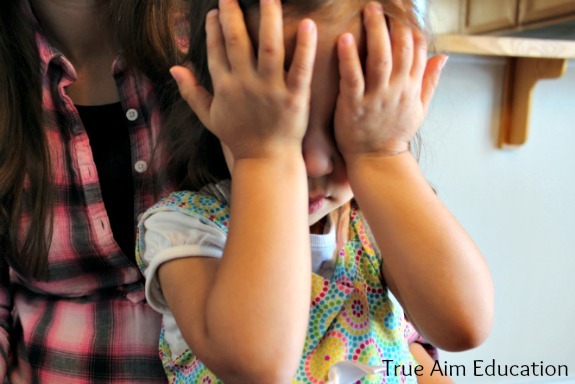 To play, simply tell your child to cover their eyes. Take a toy away and have them try to guess which one you’ve taken. Ask them to tell you where it was with the vocabulary you explained earlier. If your child is having trouble, give them some hits like, “Was it at the beginning of the line, or the end, or in the middle?” If he is still struggling, use less objects. Now it’s their turn! Close your eyes and have your child take a toy for you to guess. Act like he chose a really good one, that it’s so hard to figure out, and he’ll be hooked on the game for a long time. 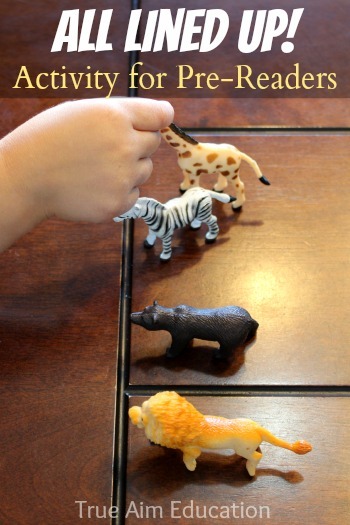 You can help your children review and learn lots of vocabulary with this game too. Just choose objects like shapes, colors, or even pictures. It’s a huge memory booster! Watch the video below for an example of how to play! Don’t forget rewards! Sometimes, I reward Emma with Popsicle sticks to add even more fun! However, a tickle after I guess the wrong object she has taken and claim that she tricked me is usually all it takes to create priceless memories. 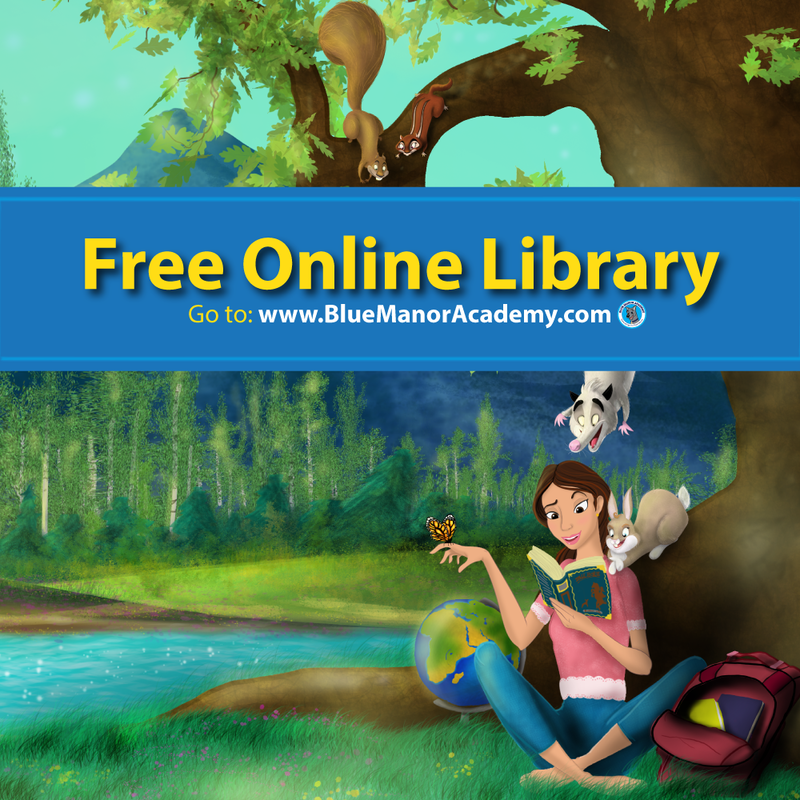 What’s your child’s favorite learning game? 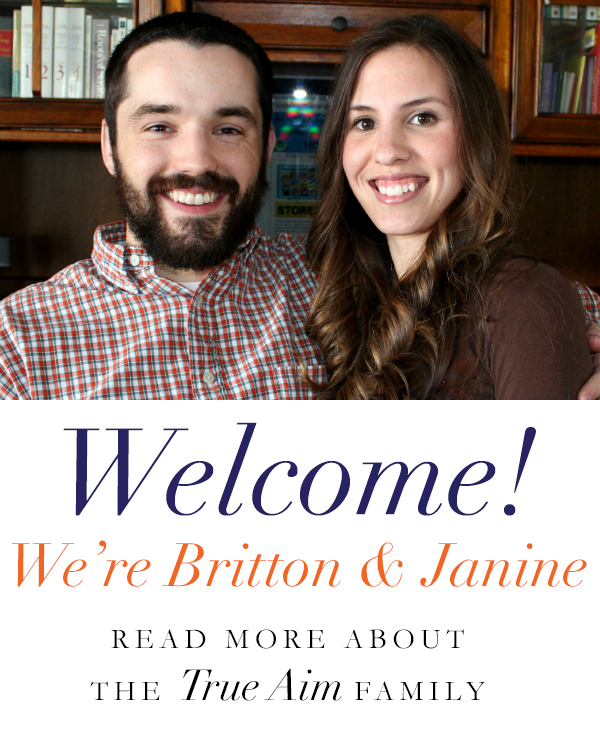 For more reading activities, like me on Facebook or Follow me on Pinterest. Thanks for your support! 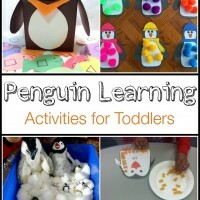 Check out My Christian Preschool Curriculum! 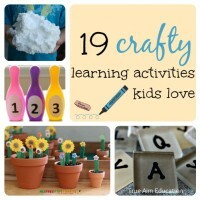 19 Crafty Learning Activities Kids Love! What a great way to teach beginning, middle and end! What a fun, simple, and engaging way to practice order words and memory. Thanks for the video. Your daughter is too cute.